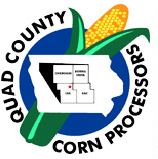 The very first commercial-scale cellulosic ethanol gallons flowed from the Quad County Corn Processors (QCCP) distillation unit in Galva, Iowa this week, made from a “bolt-on” process that allows a plant to convert the kernel’s corn fiber into cellulosic ethanol, in addition to traditional corn starch ethanol. “Our Adding Cellulosic Ethanol (ACE) project will not only increase our plant’s production capacity by 6 percent, but it will also continue to boost energy security and provide consumers with more low-cost, cleaner-burning ethanol without adding any additional corn to the production process,” said QCCP CEO Delayne Johnson, who also noted the new technology will improve the plant’s distillers grains (DDGs) co-product. 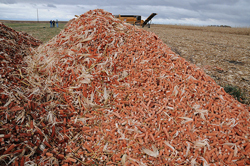 “As a result of the new process, the DDGs will be much more similar to a corn gluten meal. It will increase the protein content of the livestock feed by about 40 percent, and we also expect to see a boost in corn oil extraction by about 300 percent,” he said. Cellulosic ethanol is no longer a “phantom fuel” and corn is helping it become a reality.